5 tier Rev-A-Shelf Women's Lazy Shoe-zen. Each shelf rotates 360° for total access. Each set of shoe horns feature individual height adjustment for various shoe styles. Fits up to 96" closet height. 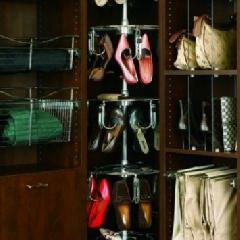 Holds up to 25 women's shoes (5-shoe horns per shelf). Post can be cut for shorter height application.